The annual report gives a bleak outlook on housing costs around the US. There is nowhere in the country where a person working one full-time minimum wage job can afford to rent a modest two-bedroom home, according to an annual report from the National Low Income Housing Coalition. The group says its 2018 Out of Reach findings demonstrate "how far out of reach modestly priced housing is for the growing low-wage work force." It can be tough to afford housing even in the least-costly of areas, the study found. While Arkansas was deemed the cheapest state for housing, a person working a 40-hour week there would still need to earn $13.84 an hour to afford a two-bedroom home. But the minimum wage in Arkansas is just $8.50. 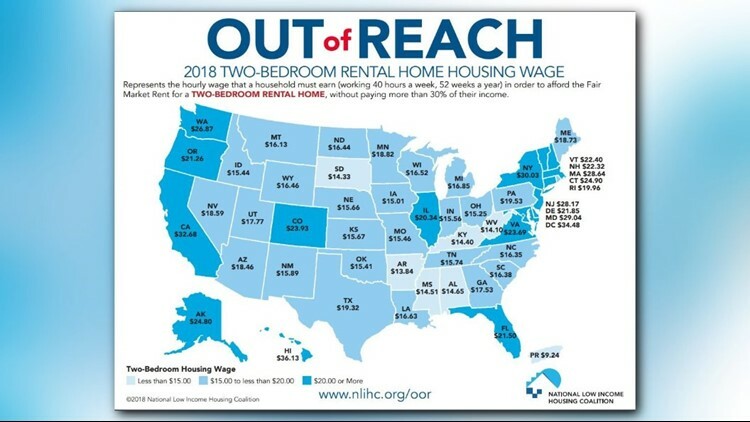 At the other end of the price range, the report found Hawaii had the most expensive housing and would require a person to make $36.13 an hour, or $75,158 annually, to afford a decent two-bedroom apartment. The coalition said nationally a worker would need to earn on average $22.10 to afford a two-bedroom home and $17.90 for a one-bedroom apartment. That means a full-time worker earning the federal minimum wage of $7.25 would need to work 99 hours per week to afford a one bedroom apartment at the national average fair market rent. The report also found that there are only 22 counties in the U.S. where a full-time minimum wage worker can afford a one-bedroom rental. They noted that each of those counties were in states with a minimum wage higher than the federal requirement.